Allahabad has always been the heart of spirituality in India. The charisma of this city with tangy chaat by the roadside and the swifts of cold breeze from the sangam of three rivers will bring an instant smile to your face. While the city is known for its mandirs, ghats and the high court, we found a few streets you cannot leave untraveled. Giving us a vivid image of the life in the cities of Allahabad and Benaras, Neelum Saran Gaur narrates the story of Janki Bai Ilahabadi, a woman who was revered for her singing by maharajas, poets and the like in early twentieth century. Inspired by the funny and witty series of short stories in Requiem in Raga Janki, we found a few spots that you cannot afford to miss when in the city of Sangam. A dream of every realtor today, Anand Bhawan was once a dilapidated building converted into one of the most modern estates of its time by Sri Motilal Nehru, the proud father of the first Prime Minister of its nation. The land comprises of ten houses that became the epicentre of the great Indian Freedom Struggle as great leaders like Mahatma Gandhi, Patel and others gathered here for momentous discussions. Now a museum, this expansive land with beautiful gardens and extraordinary architectural walls, this place should top your itinerary for Allahabad. Janki Bai Ilahabadi, the star whose voice took her from penury to palaces and royal durbars,belongs to the city with the thriving Awadhi culture where singers, poets and musicians assemble. Her enthralling voice became the melodies of palaces and maharajas, maharanis, poets, nawabs, judges were counted as her fans. Known as Janki 'Chappan Chhuri' for surviving fifty six knives attacks, this woman epitomises bravery and miracles. When in Allahabad, pay a visit to the tomb of this legend whose known to have survive all odds and rise as a star. If this intrigues you, Requiem In Raga Janki is a must-read for you. As written by Neelum Saran Gaur 'memory overreaches reality', this whimsical town proves it right. From a paanwalla to a famous local mixer, Lallu does it all. Started off as Lallu Paan Bhandar, now this place is quite well known for the best cold drinks in the town. When in Allahabad, trying the masala coke here should be on the top of your to-do list. Not a fan of Coca-Cola? Look out for Masala Thums-Up, Masala Limca, Masala Mirinda and various other delightful mocktails here. The boat ride at the Sangam Point when the sun is just about to go down is well-now (but must-do) thing to do. Go for a ride and enjoy the scenic sunset at the ghats for the memory of lifetime. Make sure the batteries of your phones (or cameras) are charged, because you wouldn’t want to stop snapping every second of it. There’s so much food in the streets of Allahabad that no number of days will ever be enough to explore if you call yourself a foodie. From chaats to halwais every street is full of flavours that will surprise your palate. Chholey Bhature at Chunni Lal Restaurant, absolutely anything at Shiv Chaat Bhandar, Thandi Fruti Cream at Radhe, Dehati ke Rasgulle are just a few names to start with. Janki Bai’s father was also a very famous halwai of his times, and coming from the rich heritage of the city, every sweet dish in the city has its own special flavour. So, if this list has got you feeling excited and hungry, there’s no reason you shouldn’t planning a little getaway to the mysterious streets of Allahabad, where every corner has a tale to tell. 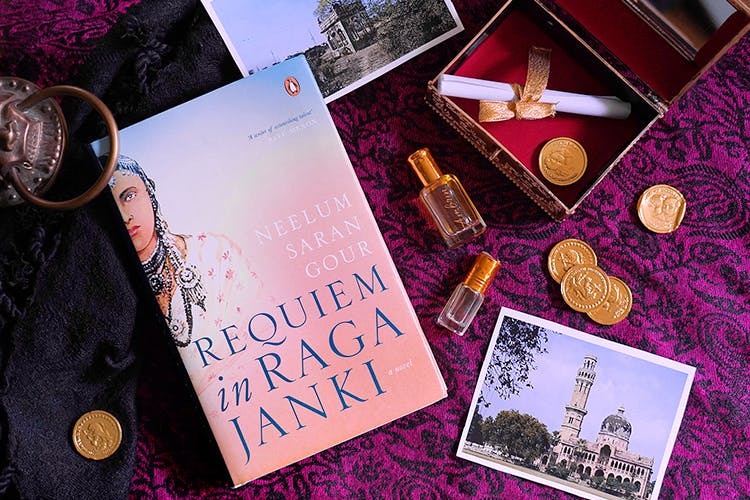 And if you’re looking for an enthralling read for this journey, nothing could be better than Requiem in Raga Janki by Neelum Saran Gour. A book that will enlighten you with inspiring stories of the city and its people before you get there. Grab your copy here!